ENCINITAS — Encinitas’ days of non-compliance with state housing law appear to be numbered. On Nov. 13, Superior Court Judge Ronald Frazier made it clear that while the court is giving the city two more weeks for the final vote of Measure U to be tallied, it was necessary to soon find “a remedy,” he said. The next court hearing will be on Nov. 28 at 1:30 p.m. in Vista. The lawsuits brought against Encinitas by San Diego Tenants United and the Building Industry Association of San Diego center on the city’s failure to enact a Housing Element, a state-mandated plan that details how a city will meet its housing obligations, particularly as they pertain to low-income residents. The suits present two sides of the same coin: The building industry suffers when housing developments do not get built, while low-income tenants suffer when there is not enough affordable housing available to them, the plaintiffs contend. At the hearing, Frazier referred to the failure of Measure T in 2016 followed by the presumed failure of Measure U — both ballot initiatives intended to get Encinitas compliant with California housing law — when he said, “After two bites at the apple, an impasse has occurred.” He made it clear that the court would now have to intervene. On April 30, Frazier gave Encinitas until Nov. 13 to secure voter approval for a housing plan. Unofficial election results show 52.5 percent of Encinitas voters saying no to Measure U, while 47.5 percent have so far voted in favor. Attorneys for the city argued that with uncounted ballots at large, the court should wait to render a decision. The judge granted that request but said he was “dealing with probability and statistics, as did the mayor.” Encinitas Mayor Catherine Blakespear announced in a newsletter last week that it appeared that Measure U would fail. 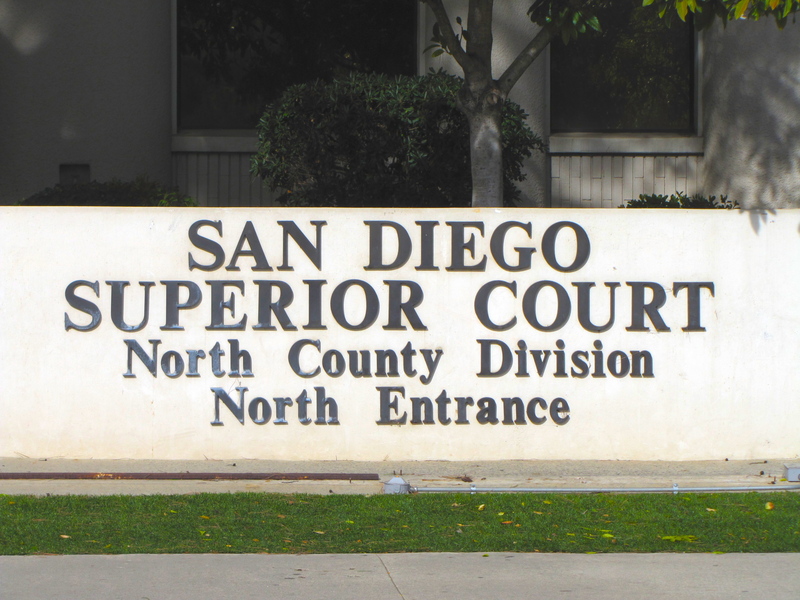 Hutter argued in court that Encinitas should be given no more than 120 days to become compliant, and he pushed for the invalidation of Proposition A as it pertains to the creation of affordable housing. Proposition A gives Encinitas residents the right to vote on major zoning changes, such as those needed to upzone parcels of land to allow for high-density, affordable housing. The residents, not the City Council, have the authority to make those types of final housing decisions. The plaintiffs also questioned the legal adequacy of Measure U and whether the state housing authority, the California Department of Housing and Community Development, would find the plan compliant and certifiable. In June, the City Council removed four sites from its high-density housing parcel list, which brought the affordable-housing unit count below the 1,600 strongly advised by Housing and Community Development and the city’s legal counsel from Goldfarb and Lipman. The changes also potentially violated the housing law that mandates that 50 percent of the sites selected for development be vacant, but the city felt it could successfully argue that a particular site be considered vacant. The council made those decisions on a 3-2 vote after getting a much sought-after letter of pre-certification from Housing and Community Development. Fearing that the plan would not pass muster with voters, the council knowingly approved a revised plan that was legally dicey. Frazier recommended that the two plaintiffs and Encinitas pursue mediation before reconvening in court on Nov. 28. But Blakespear foresees difficulty in that path. In closed session on Nov. 14, the Encinitas City Council will discuss the possibility of mediation with its housing attorneys. Given how difficult it was for the council to decide which parcels to upzone because of impassioned resistance from residents, City Councilman Tony Kranz wondered if mediation had the potential to “take politics out of the equation but not the controversy.” But he noted that more information was needed from the city’s legal team as to how mediation could work in this case. Kranz observed, “The judge is clearly struggling with what the right remedy is for this predicament we find ourselves in.” Kranz hopes the parties or judge can arrive at a solution that balances state compliance with the will of the people as was asserted through the democratic process. Although Ijadi-Maghsoodi serves as the assistant director of public service at University of San Diego School of Law, her work on this case is unrelated. She is providing pro bono services and took a vacation day from USD Law to volunteer her time. The reporter should state how much low income housing, being labeled as affordable housing, the BIA developers will build on the city selected very low density (some are R1, R2) private parcels. From all indications, no more than 15% and probably closer to 10% or less of low income housing may be built and the rest will be market rate condos. The City Council is moving away from requiring 25% (discussed in October Council meeting). Does the Court have this information? Less than 200 low income units out of 2000 condos (if density bonus) won’t make a dent in the RHNA numbers assigned by SANDAG and the State. Why is Encinitas being sued when 95% of the other cities and counties haven’t come close to building their required low income housing (per a state report). Why isn’t the BIA and San Diego Tenants United filing a class action suit against the other 481 cities in California for not meeting state requirements? To placate the BIA and developers, this City Council has removed many of the safeguards of the current Housing Element that is in the General Plan. Some of these safeguards remain in the Housing Elements of other cities and, yes, the officials at HCD have found that those Housing Elements have substantial compliance with State Law. The City Council added more policies than required by law. Many of these new policies will be difficult if not impossible to carry out which leaves another wide loophole for more lawsuits. Additionally, the new housing laws that took effect in January of this year are being applied to only a few cities. The rest of the 450 cities won’t have to abide by the new January 2018 law until after 2020. By that time the law may change. In which case, the Encinitas Housing Element will be held to this law that may be more draconian than future laws. The property owners of the selected parcels will reap a windfall with the upzoning. Does the Court have this information? Is there a law principle that there shouldn’t be an enrichment for the property owners? SANDAG has a fact sheet on the San Diego region required percentage allocation of the 171,685 dwelling units that will be required to be built in the next state housing cycle. It is an intriguing document with 40.20% of housing dedicated to restricted income of very low (less than $45,450) and low income (less than $72,750) and 42.50% dedicated to above moderate income (120% and above of the area median of $79,300 (all income quoted for a family of four). That gap between the low income and above moderate income families which should be the affordable areas of housing for families with a moderate income (less than $95,150) is only designated at 17.30% of the 171,685 new dwelling units mandated by the State and HCD. If these housing percentages are representative of the entire state, the middle income wage earners will be pushed out of California. The new Regional Housing Needs Assessment (RHNA) numbers are for the very poor or the very rich. Developers don’t want to built restricted income housing. What is left for development is housing for the rich. More information on this fact sheet is on the SANDAG website.